For the non techy ‘Jacks’ amongst us, it’s not so easy to get our heads around how electronic connections work and we definitely don’t want to be left behind in this fast moving online world. To try and explain the concept for those who unfamiliar with tech terms, we have drawn out the elements of connections to show how they link together. API’s were designed as technical communication tools to communicate between servers, programs or applications and to push existing information from one application to another. The bridge is a link or router that connects an API call to the principal/client (database) for which it’s supposed to be. So when an API call comes in, the bridge will know where the ResRequest client database is for that call and will route it to the appropriate server and database. 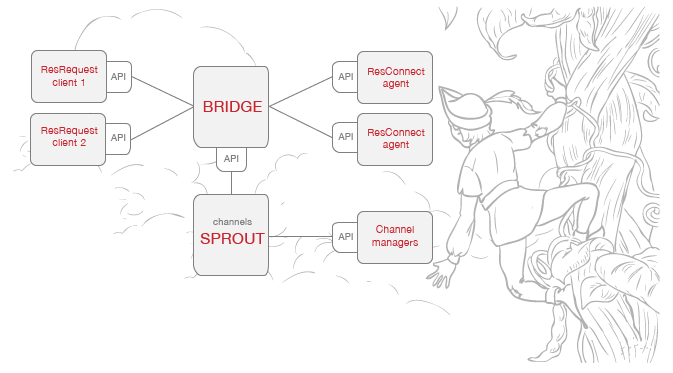 Sprout is an API converter/translator and it’s designed to store information and act as communicator between our API, ResConnect and others, such as NightsBridge‘s and SynXis‘ API. It has ‘push’ and ‘pull’ data functionality. With NightsBridge and SynXis APIs, Sprout allows NightsBridge and SynXis to pull information such as stock, rates and even create reservations. It can store up to two years of client availability and will update all transferred information every 5mins. ResConnect is the service offered by ResRequest – this is our API which gives specialist agents and tour operators access to live availability and rates of ResRequest clients, by electronically communicating with their own internal systems and even offering the functionality to book. To get stock even more wider spread – online travel agents (OTA) such as Bookings.com and Expedia and global distribution systems (GDS) like Amadeus, can display ResRequest client inventory via a channel manager. We interface to Nightsbridge to place your rooms on these online platforms. Going forward, we hope that you may not be too daunted to get involved with the possibilities that this magical ‘bean sprout’ has to offer. Our future development plans include an upgrade of the user interface and sprout update failure notifications.